An Awards Luncheon was held at the Hall on 26 April for students and staff from educational establishments currently supported by the Tallow Chandlers Benevolent Fund. 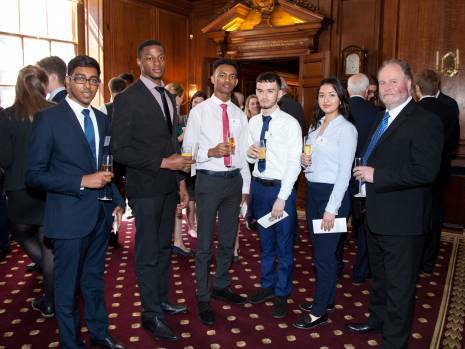 The event provided an opportunity for members of the Company to meet the outstanding young people to whom we make awards and bursaries, as well as those who work with them. 27 students attended from a range of schools and universities receiving Tallow Chandlers support with representation from the City of London School for Girls, City of London School for Boys, Cubitt Town Junior School, Greig City Academy, Halley Academy, King Edwards School Witley, Reed’s School, Manchester & Salford URNU, Selwyn College Cambridge, Guildhall School of Music and Drama, the University of Manchester and the School of Oriental and African Studies (SOAS). The guest speaker was Ms Robyn Bruce, Headteacher at Cubitt Town Junior School. Other guests included staff from City & Guilds and the University of East London.